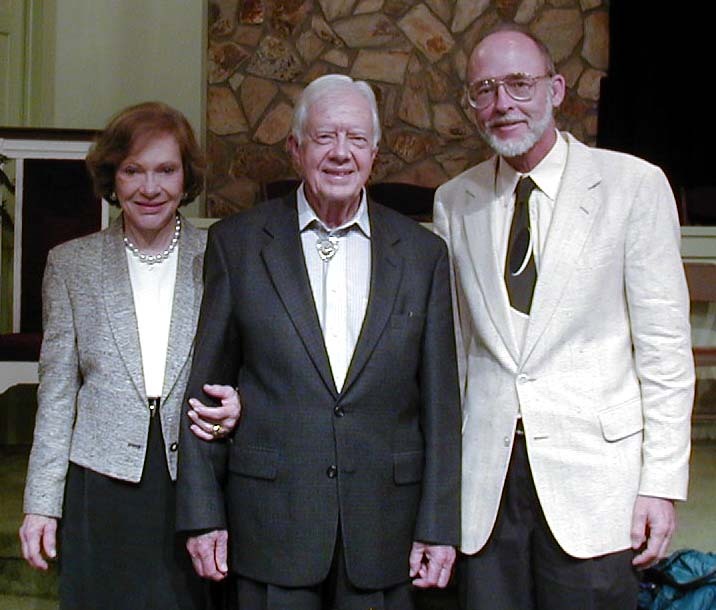 A picture to treasure - Rosealynn Carter, Jimmy Carter, and me. I left Ft. Myers, Florida behind on Monday 19 April, and drove to an RV park on the outskirts of Orlando, near EPCOT. The next morning I was up early and on my way early because I had been told that the park often opened before the official time of 9AM. Wrong! I got to wait at the toll gate before getting into the parking lot, and then again at the park entrance. They let us in at 9AM. I had been to EPCOT once about 20 years ago and a lot has changed. Back then I thought it was slanted toward education. Now my impression is that the slant is toward entertainment. The rides have gotten better. My favorite (I rode it three times) was a rocket trip to mars. The liftoff is especially realistic; you can feel the G force increasing as the ship accelerates. My day ended with a great fireworks show over the EPCOT lake, then the challenge of finding my way back to my RV park in the dark. The next day I drove to a park in Titusville, unhitched, and rushed to the Astronaut Hall of Fame, then to the Kennedy Space Center. The 3-D IMACS film on the space station is excellent. You feel like you are right there. There is also an "Astronaut Encounter" with an astronaut who answers questions. The MC walked up a ramp to the stage to introduce astronaut Don Peterson. Don ignored the ramp and hopped easily onto the stage. I assumed he was an active astronaut and was amazed to learn that he is 70 years old and has been retired from NASA for more than 20 years. 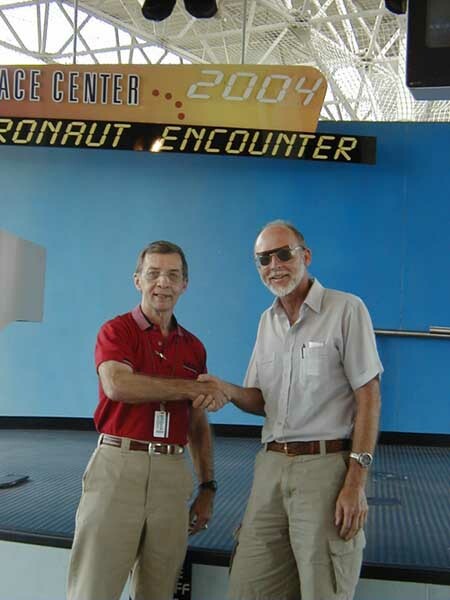 Astronaut Don Peterson and me. My next stop was the Jacksonville home of my cousin Jeff Downs and his wife Bonnie. Jeff's father - my uncle Stewie - had died at the end of March, and the three of us flew up to New England for his memorial service. Stewie's wife and children - my aunt Thelma and cousins Jeff, Nancy, and Linda - did an excellent job of planning and presenting the memorial service and the reception that followed. I heard several heartwarming stories about the good things Stewie, and Stew & Thelma, had quietly done for others. I got to see cousins I hadn't seen for years, and their children, some of whom I had never met. Jeff is the chief plant engineer for a paper company, and after we returned to Jacksonville, he took me on a tour of his plant. It was fascinating to watch the paper travel at 30 miles per hour through the machine, and be wound into 30 (or 40?) ton rolls. We saw the whole process from the piles of scrap cardboard that were the raw material through to the finished rolls, wrapped, labeled, and ready to be shipped. Leaving Florida, I stopped overnight near Okefenokee where I visited the Folkston Funnel, a viewing platform near the junction of 2 major rail lines that is equipped with a railroad radio and ceiling fans. I watched and photographed several trains, then went home and tried to sleep in my trailer which was also located near the junction and, worse yet, near a grade crossing that required long loud whistles from each passing train. I understand up to 60 trains pass here in a 24 hour period. Not a restful night. 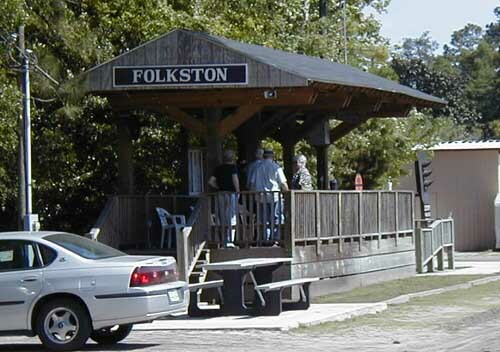 The Folkston Funnel - train observation platform. My final stop for this report is Americus, Georgia. Americus is the home of Habitat for Humanity (HFH), and the next town is Plains, GA, the hometown of former president Jimmy Carter. To the north is Andersonville where one of the largest Confederate prisoner of war camps was located, and where the National Prisoner of War Museum is found. HFH is in the process of building a "Global Village" which has examples of the types of houses built by HFH in other countries. Houses have been completed for many African countries, and an Indian house is under construction. The old Plains High School has been renovated and is now a museum of local history, particularly as it relates to the Carters. Near the center of town are Billy Carter's old gas station, and the old train depot that was Carter's presidential campaign headquarters. Three miles down the road in Archery is the farm where Jimmy Carter spent his boyhood. The house originally had an outhouse, but Jimmy's father Earl Carter later installed a windmill and water tank with gravity feed to the house where they installed a bathroom with a toilet and a shower. 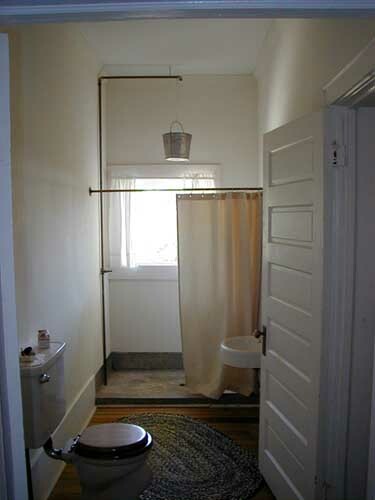 The shower consisted of a cold water pipe that emptied into a bucket suspended over the tub. The bucket had a bunch of holes in the bottom so that it acted as the shower head. I'm not a religious guy, but I am a big fan of President Carter, so when I learned that he taught a Sunday school class that was open to the public, I put on a coat and tie and drove to the Maranatha Baptist Church, arriving at 8:15AM for a 10AM Sunday school class. Several busloads had arrived before I did, and there was a long line, but we all made it into the church and were told that this was a relatively small crowd - they have had as many as 800 people arrive for Sunday school. This small church with about 40 member families, sees many thousand visitors each year, mostly because President Carter teaches Sunday School every Sunday when he is in Plains. Before the President arrived the rules and procedures were explained to us; we were allowed to take pictures during the greeting, but not during the lesson. We should not applaud the President at any time or ask for his autograph. And if we wanted our picture taken with him, we would need to stay for the church service. 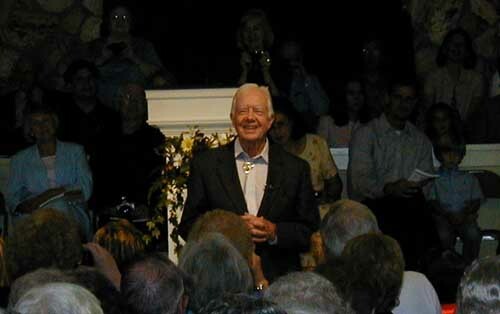 President Carter greeted us, asked where we were from, then asked if there were any ministers in the audience, The gentleman sitting next to me identified himself as a missionary, and was asked to give the opening prayer. President Carter then talked briefly about wars including WW II, Vietnam, and Iraq, then gave his lesson which related to Peter, Paul, and Mark. Jimmy Carter greets his Sunday school class. Following Sunday school, the regular church service took place in the same location, then the president and his wife (we were told she is ROSE a lynn, not ROZ a lynn) patiently posed with us visitors in large groups, families, and a few individuals like me. My personal time with the president was brief. We had been told not to talk with him - not to tell him what great supporters we were or how much we admired him. I stood beside him, he asked, "Are you alone? ", I replied "Yes, sir", the picture was taken, I said "Thank you" and that was it. I have long admired President Carter, am very pleased to have seen him in person, and will cherish the picture of the Carters and me. I expect to stay here in Americus for another day, then move on toward F. D. Roosevelt State Park near Warm Springs, GA. I also plan for there to be several state high points in my near future.